1. Culling, either of all animals or infected animals only, is often suggested as a way of managing infectious diseases in wildlife populations. However, replicated experiments to investigate culling strategies are often impractical because of costs and ethical issues. Modelling therefore has an important role. Here, we describe a suite of models to investigate the culling of infected animals to control an infectious cancer in the Tasmanian devil Sarcophilus harrisii. 2. The Tasmanian devil is threatened by an infectious cancer, Tasmanian devil facial tumour disease. We developed deterministic susceptible, exposed and infectious (SEI) models with diﬀering ways of incorporating the time delays inherent in the system. We used these to investigate the eﬀectiveness for disease suppression of various strategies for the removal of infected animals. 3. The predictions of our models were consistent with empirical time series on host population dynamics and disease prevalence. This implies that they are capturing the essential dynamics of the system to a plausible extent. 4. A previous empirical study has shown that removals every 3 months did not appear to be suﬃcient to suppress disease in a semi-isolated infected population. Our models are in accordance with this observed result. The models further predict that while more frequent removals are more likely to be eﬀective, the removal rate necessary to successfully eliminate disease may be too high to be achievable. 5. Synthesis and applications. 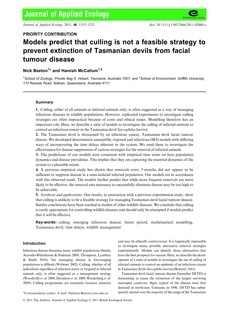 Our results, in association with a previous experimental study, show that culling is unlikely to be a feasible strategy for managing Tasmanian devil facial tumour disease. Similar conclusions have been reached in studies of other wildlife diseases. We conclude that culling is rarely appropriate for controlling wildlife diseases and should only be attempted if models predict that it will be eﬀective.